High pressure power washing is necessary to prime surfaces that need to be rid of old paint, rust, and other corroding surface elements. General contractors often use high pressure power washing to guarantee a clean surface before doing construction work, like sandblasting, painting, or other cosmetic repairs. Businesses looking for commercial power washing in the Greater Philadelphia area choose us because they know we have the expertise and the tools to get the job done right the first time, every time. At AW Painting & General Contractors, we offer complete remodeling and repair services especially in older buildings that are structurally sound, but need a lot of work to become business-ready. With over 40 years serving the areas of Philadelphia, Southern New Jersey, Delaware and Lehigh Valley, one of our most requested maintenance services is commercial power washing. We engage in construction work by following strict safety measures not just in high pressure power washing, but in everything we do. Many people are surprised by the sheer force of power washers and the amount of strength it takes to maneuver one. There are serious risks in operating one especially if you are not familiar. Power washing is not like using a hose. 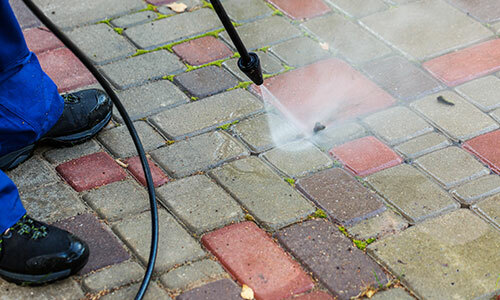 Not everyone can turn on the power washer and successfully use it to get rid of decaying surfaces. The sheer force and speed of the water can cause damage if not operated by a professional contractor. If used incorrectly, it can shatter glass or sidings as well as hurt others. At AW Painting and General Contractors, we have professional-grade tools that only contractors and construction professionals can access. This results in a more thorough cleaning process that will result in a high-quality finish. The expertise of power washing should never be underestimated. It can help remove corrosion, pollutants, rain damage, mold, mildew, and other debris. Commercial power washing is one of the first steps general contractors take when starting cosmetic surface repairs. However, it needs to be done carefully. For older structures, it is important to consider the age of the building and the type of siding it has. At AW Painting and General Contractors, we take these things into consideration before proceeding to ensure the best outcome for your building remodel. Interested in our commercial power washing services? Request an estimate and get in touch today. We look forward to assisting you.